I don’t know what you guys do on either Saturday morning or Sunday nights but I check everywhere online and through cookbooks for new recipes to try out for the coming week.. This is Chicken Spaghetti is one of my husband’s all time favorites. It comes out of my mom’s first edition cookbook and it is to die for! It makes a TON of food! Try it out… you will not be sorry! Boil chicken until tender. Remove bones and reserve the stock. ( I always use boneless though) Saute the onion, celery, and pepper in butter until tender. Boil spaghetti in chicken stock. Do not drain all the way.. leave about a cup or so of the water. Remove from stove and add all the other ingredients, besides the Cajun Seasoning. Pour into a casserole dish, and sprinkle generously with cajun seasoning. Bake at 325 degrees for 30 minutes and Enjoy! The Cajun Seasoning can be a little spicy so if you have little ones don’t put to much because after it is cooked everyone can add as much as they want. 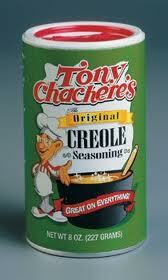 This is the Cajun Seasoning we get and it’s Awesome! Looks delish! Going to have to make this! Sounds Yummy, going to get your mom’s book too, how fun! Chicken Spaghetti- its a MUST try!